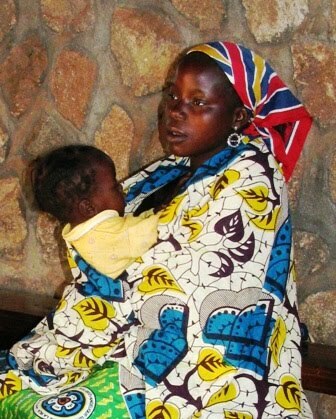 African Water Log: Happy Mothers Day from the Central African Republic! Happy Mothers Day from the Central African Republic! Happy Mother's Day to all mothers and grandmothers reading this blog! We'd like to wish a happy Mother's Day to all the mothers in the Central African Republic, as well, even though the official date of celebration here in CAR is later this month. The Central African Republic is the country with the highest maternal death rate in Africa. According to a U.N. report issued in March, 1,355 mothers die per 100,000 live births. Under-five mortality is 176 deaths per 1,000 live births and infant mortality 106 deaths per 1,000 live births. (For more details see United Nations Office for the Coordination of Humanitarian Affairs - Integrated Regional Information Networks (IRIN) http://ochaonline.un.org/humanitarianappeal/webpage.asp?Page=1918). The Evangelical Lutheran Church of the Central African Republic, along with its partners in the U.S. and Europe, is helping by running two medical clinics  one in Gallo in western CAR, and one in Bohong, in the northwest. These clinics offer pre-natal care which can help prevent maternal and infant deaths, along with modern delivery rooms and post-natal check-ups for infants. The same U.N. report states that, in addition to malaria, water-borne diseases are one of the major afflictions suffered by Central Africans. PASE, (the French acronym for the church's water management project), is constructing spring boxes to provide safe drinking water for villagers. This is an inexpensive, sustainable method for providing clean water. Each spring box costs an average of only $2000, but can provide water for hundreds of villagers for decades with little or no maintenance required. Since it is usually the women of the household who fetch water for the family, what better gift to give for Mother's Day than the gift of clean water? Photo: Anastasie Feikomo and her infant, Deborah, face a brighter future because of literacy and health classes offered by the Evangelical Lutheran Church of the CAR. She is the wife of future pastor, Vincent Mathieu Sodea. Both Anastasie and Vincent are students of Pastor Deborah Troester, instructor at the Theological School of Baboua, CAR. Joe and Deborah Troester are ELCA missionaries in Baboua, the Central African Republic. Pastor Deborah teaches at the Theological School in Baboua. Joe serves as technical advisor for PASE, which provides clean drinking water and promotes good hygiene and sanitation to villagers. Their daughter, Christa, attends eighth grade at Rain Forest International School in Yaoundé, Cameroon.